The midterm elections are sooner than you think, but are students ready to vote? NewsWatch Reporter Gracie Snyder tries to answer the question. The 2018 midterm elections are right around the corner, and many young voters said they are headed to the polls. New data suggests the potential for a record youth turnout in the next two weeks, with Harvard’s Institute of Politics (IOP) fall 2018 poll revealing 40 percent of 18-to-29-year-olds say they will “definitely” vote in the midterms. That surpasses the 2010 and 2014 numbers gathered by IOP. 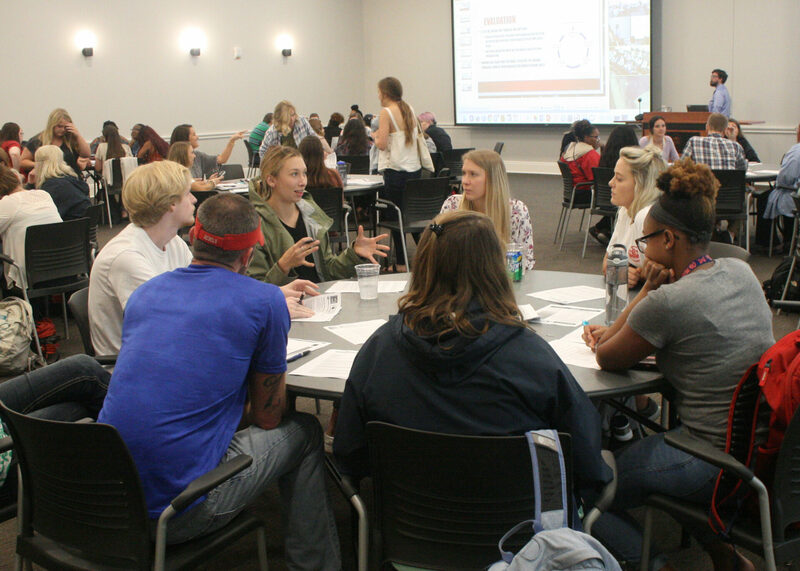 UM students work in small groups to create a voter action plan during the Voter Empowerment Seminar, hosted by the Department of Social Work. Photo by Halleigh Derrick. Conor Dowling, University of Mississippi associate professor of political science, said he believes there are some key reasons why people decide to stay home on Election Day. “A lot of people feel like they don’t have enough information to cast an informed ballot, and that sometimes prevents them from wanting to vote or feeling like it’s worth their time to vote,” he said. In a recent campus poll, five UM students were asked if they planned to vote in the upcoming elections. Four out of five said yes. One student said he will not be voting because of schoolwork. “I’m not planning to vote on the midterm elections just because of how busy schoolwork is here and how busy my life is around here,” said Roman Votour, freshman. For many freshmen, voting will be a new experience. Dowling said the results of the Harvard poll do not surprise him. “I think there is a sense at least from talking on campus and in classes that a lot of young people are more interested this time around,” he said.